The NASM Certified Personal Trainer and Exam Preparation program is a unique online training that prepares for the NASM CPT exam. The NASM CPT certification is one of the most respected and in-demand certifications in the health and fitness industry. The NASM Performance Enhancement Specialization can give you the expertise to improve the flexibility, speed, agility and performance of both professional athletes and weekend warriors. This program includes exam preparation, all study materials, as well as the exam fees. The NCCA accredited NASM CPT Personal Trainer Exam is taken at a local testing center (PSI), and you can schedule your exam date after completion of the program. Upon successful completion of the NCCA accredited credentialing exam, you will earn the distinction of a Certiﬁed Personal Trainer (CPT) from NASM. Certiﬁcation is only the beginning. 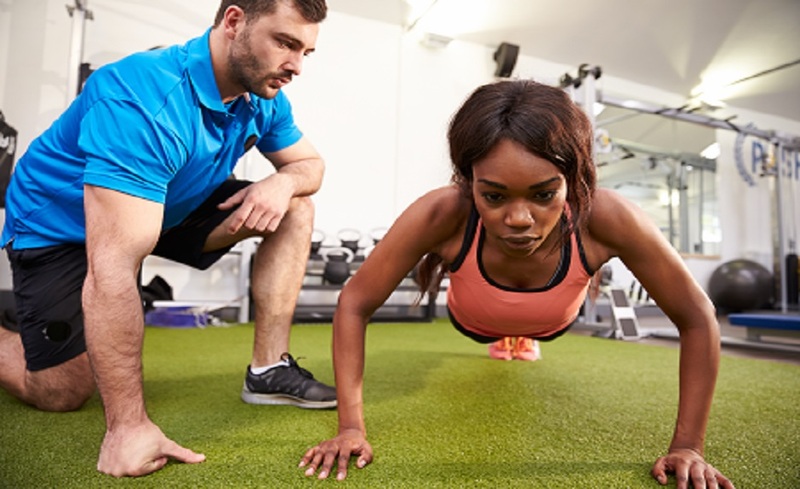 This program will prepare you for successful employment as an NASM Certiﬁed Personal Trainer who is qualiﬁed to work in a health club setting, as an independent ﬁtness professional, or in other settings, such as medical facilities or corporate wellness. You will also learn about the science of human movement and discover cutting-edge, evidence-based sports performance exercise techniques that can help you train tougher, faster and stronger athletes and weekend warriors in the Performance Enhancement Specialization (PES) program. The NASM Certified Personal Trainer and Exam Preparation program brings you a robust online exam preparation solution that gives you the most extensive resources available to successfully pass the widely respected NASM CPT examination. Through the use of online videos, presentations, quizzes, readings, and interactive activities, you will get the most thorough guidance and understanding of the CPT content, as well as the knowledge needed to successfully challenge the NCCA accredited CPT exam. As a student, you will learn the knowledge, skills, and abilities to become a successful NASM personal trainer. Based on scientiﬁc research and ﬁtness expert experience, the program is directly aligned with critical occupational competencies - including those deﬁned by the Bureau of Labor Statistics Occupational Outlook. Each module is broken down into separate topics such as: human movement science, nutrition, movement assessments, program design, and how to create an integrated training program using the unique NASM OPT model (Optimum Performance Training) - a safe and effective way to help a client reach any goal. The needs of today’s modern athlete and weekend warrior are continually evolving and changing. NASM Performance Enhancement Specialist (PES) provides the most innovative evidence based science, systems, and solutions for professionals to help enhance their knowledge of delivering consistent results to their clients. Through our research institute at UNC Chapel Hill, NASM is able to research the latest trends, techniques, and training styles and deliver it in a compelling fashion to provide the end practitioner practical and applicable tools for success in sports performance training. This program includes exam preparation, all study materials, as well as the certification exam fee. The NCCA accredited NASM CPT Personal Trainer Exam is taken at a local testing center (PSI), and you can schedule your exam date after completion of the program. D. Review NASM’s standards of professional practice as it relates to a career as a professional fitness trainer. This program can be taken on a Mac or a PC. On a PC, it is compatible with Windows 7 and later operating systems and the current versions of Firefox, Chrome, or IE 11 and later browsers. We recommend that you use Chrome and Firefox in place of other web browsers. You’ll also receive access to practice exams and study materials, to help you prepare for your certification exam. There are no prerequisites to take the online NASM CPT Certified Personal Trainer Certification and Exam Preparation program, but there are prerequisites to complete the NCCA Accredited Certification Exam. The NCCA accredited NASM CPT Personal Trainer Exam is taken at a local testing center (PSI), and you can schedule your exam date after completion of the program. This is not an instructor facilitated program; however, NASM will provide support through access to email support and phone. Upon successful completion of the program, you will be awarded a certificate of completion. You will also be able to sit for the NCCA accredited NASM CPT Personal Trainer Exam that is taken at a local testing center (PSI) and you can schedule your exam date after completion of the program. There is no facilitator for this program. NASM does offer students support through access to email and phone. This program prepares you for the NCCA accredited NASM CPT Personal Trainer Exam. The exam is taken at a local testing center (PSI), and you can schedule your exam date after completion of the program. You will also be prepared for the Performance Enhancement Specialist (PES) exam.